One of the questions we commonly ask is, “’How Long Do Deer Live In The Wild?’’ These beautiful creatures, with their strong bodies but almost delicate features, appear in almost every continent. That’s apart from Antarctica. They come in a huge variety of species, such as white-tailed deer, mule deer, caribou, and elk. Most of these are found in areas such as the Rocky Mountains of the U.S.A.
We often believe that species such as red deer, roe deer, and fallow deer are distinctly European. We also believe that they often live in parks or reserves where we protect them, but still wild. So how long do deer in the wild life compared to their friends in captivity? We often ask this question about virtually every species that humans keep in captivity. Indeed, it is a fundamental question that we, as humans, need to exhaustively answer. It helps to assure ourselves that we are doing the right thing for animals. 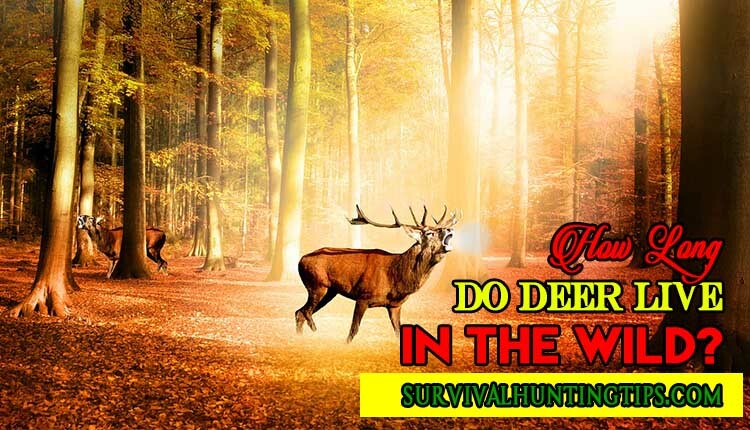 Hunting deer has been a tradition in Europe and North America for centuries. Indeed, Europeans and Americans consider it to be more than a sport. We also consider it as a rite of passage for many men. This is because we relentlessly pass over this passion onto our sons, and these days, daughters as well. According to the Virginia Dept. Of Game & Inland Fisheries, during 2017 to the 2018 deer-hunting season, hunters harvested a total of 189,370 deer in Virginia. This total included 95,474 antlered bucks as well as 12,822 button bucks, and 81,434 does. As this is only one state in the U.S.A., you can assume that this number increases multiple times over in the whole country. We generally kill these animals for sport, rather than for eating. In North America, this can be animals such as black bear, coyotes, bobcats and mountain lions. With coyotes being the worst culprits as their habitat is very widespread. In Europe, the gray wolf is the most common predator, with the brown bear occasionally adding to the toll. However, these dangers are more natural and would probably happen anyway, certainly in areas where humans are rare. Estimates indicate that we kill more than a million deer each year in the U.S.A. by cars. This does not include deer which survive their injuries long enough to move away from the scene, only to die later. The number of deer that die on the roads is on a par with those that die by hunting. A number of diseases affect the deer population in the wild. These include diseases such as Epizootic hemorrhagic-disease (EHD) and chronic wasting disease (CWD). There is also bovine tuberculosis (BTB). Outbreaks of Epizootic-hemorrhagic disease can destroy up to 50% of a herd in one season. CWD also causes major concerns as animals just waste away. Of course in the wild, deer also suffer many other unforeseen incidents including extreme weather and unexpected accidents. Studies highlighted by the leading North American universities suggest that average life-spans in different deer species vary rapidly. With the average life-span of some deer species varying vastly between bucks and does. For the white-tailed deer, studies suggest that this species lives for 4.5 years on average in the wild. This figure somewhat masks the wide difference in life expectancy between wild does and bucks. Does live for an average of 6.5 years, whilst bucks live on average for just 2.9 years. The Roe deer is a more long-lived wild living species. Individuals can live to 17 years, with the species achieving a 10-year average lifespan. Hunting by wolves and lynx greatly contributes to the early death in Roe deer. With foxes being major hunters of fawns. Unusually the average lifespan of wild Roe deer is longer than that of domesticated herds. In North America, the wild Caribou typically lives for 10 years. With females often having a 15-year lifespan. The injuries that bulls sustain following rutting season seriously diminish their life expectancy. With 5 years being the average life for bulls. Very few bulls live beyond the age of 10. The Fallow deer variety is one of the longest-lived wild living species. The average life-span of the fallow is around 14 years. The Fallows choose a habitat of forest glade as this assists their longevity. What aids the Fallow deer’s success in the wild is its love of plentiful foodstuffs. With preferred dietary staples such as grass, acorns, shoots, and berries being in good supply all year around. The Red Deer is a hardy species that have adapted well in harsh environments. One of the highest causes of death of the Red Deer is infant mortality. With a high number of death’s being noted within the year after the birth of fawns. Once a wild Red Deer has reached maturity, they are likely to have a long life. With the size of the Red Deer, at 100-340 kg, being a deterrent to traditional deer hunting predators. The average lifespan of the majestic Red Deer is estimated at 16 years. The Elk species achieves an average lifespan in the wild of 10-13 years. Although this is a reasonable age when compared to other varieties, the Elk also suffers various diseases. Elk’s commonly suffer cross-species transmission of disease easily picking up bovine based illnesses. So, How Long Do Deer Live In The Wild? Well, we have looked at the deer’s ability to flourish as a species in the wild. Hopefully, this has left you better informed as to the barriers that wild deer populations have to overcome. The most successful deer species are those that have few predators within their chosen environment. Deer species also need luck in order to live long lives in the wild. With species that limit the number of fatalities caused by road accidents or through contracted disease, being the species that generally enjoy the highest average life-spans. If you have questions about this topic, please add your comments below. Better yet, feel free to share this post with your social media friends.